Thank you for sharing Rich. I've downloaded the pdf and I'll be giving it a good study. As I understand the term that would equate to "staying with the jaw." Applying myself to this one concept has revolutionized my playing. Just cleaned this thread up and put the thirty-five points into the original post. These are now 300 dpi tif files — click an image and then you can click the hamburger menu icon in the upper right, print them on 8.5 X 11 or save them and make them into a PDF file for yourself. Thanks to all who help make this Reinhardt dedicated forum a great place to come and find out about the teachings of Donald S. Reinhardt! 109. Discuss the thirty-five basic points of tile PIVOT SYSTEM in a brief concise manner. 1. 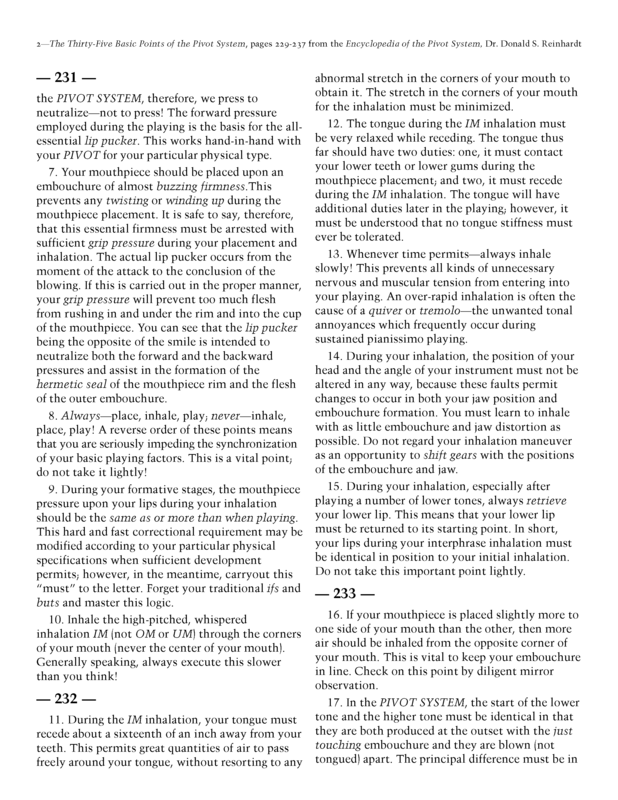 Be ever mindful of the SENSATION THEORY (question and answer twelve in chapter one), and make certain that its principles are constantly utilized throughout your playing. The primary purpose of the warm-up routines is to reestablish yesterday's playing sensations, or to adjust and align your pre-playing and playing sensations until they merge into the all-essential unified sensation. Remaining alert to the sensations involved during your playing makes it possible to master any new mechanical (physical) point in the shortest time. During the early stages of any warm-up remain conscious of the blowing sensation rather than the pitch and sound factors. Commence your warm-up with a HOOO (no tongue) attack as this utilizes only the breath and the lip-vibrations. Think of the breath and the lips as the basic factors and the tongue as the refining factor (not a crutch) to both. Never warm up so loudly that you experience strain or so softly that you feel a pinching or a holding back. It is obvious, therefore, that your warm-up dynamic level will vary from day to day in order to cater to vast physical differences. 2. Saturate your lips with saliva. This is intended to include the corners of your mouth. It is recommended that you wet your lips several times before the initial playing of the day. This should be done because the saliva to the lips often acts like ink to a blotter, especially for the first few wettings. The idea of wetting the corners of your mouth is to facilitate the inhalation and to prevent embouchure distortion from excessive mouthcorner stretching. Certain present-day squeak artists do adhere to the dry vibrating point principle; however, other than their ability to produce the high ones — their over-all tongue manipulation and control is not worth mentioning. Because tonguing tends to dampen their vibrating points with saliva, their embouchures (with the dry vibrating points) fall apart and become useless under such conditions. With few exceptions, a wet embouchure should be the first choice of any modern brass instrument performer. 3. Your lips must be formed in such a manner that they are just touching—throughout preparation for placement—throughout your placement—throughout your inhalation—and at the completion of your blowing. Your lip aperture (the space blown open -not tongued open) must occur only during your actual blowing. 4. Form your lips as if to buzz so that the membrane of your lower lip is drawn slightly in and over your lower teeth, while the tip of your upper lip reaches down and contacts your lower lip (while slightly overlapping it) at the vibrating points. This is often termed a buzzing embouchure. 5. Always approach your lips for placement with your mouthpiece and instrument in the exact playing angle. This is very important because it sets your jaw as well as your embouchure and both are a must. If the angle jumps up during the attack, then your jaw was set with its position entirely too receding; whereas, if the instrument angle jumps down—then your jaw was protruding to excess during the placement of the mouthpiece. Check on this important point by diligent mirror observation and make the necessary corrections. the PIVOT SYSTEM, therefore, we press to neutralize—not to press! The forward pressure employed during the playing is the basis for the all-essential lip pucker. This works hand-in-hand with your PIVOT for your particular physical type. 7. Your mouthpiece should be placed upon an embouchure of almost buzzing firmness.This prevents any twisting or winding up during the mouthpiece placement. It is safe to say, therefore, that this essential firmness must be arrested with sufficient grip pressure during your placement and inhalation. The actual lip pucker occurs from the moment of the attack to the conclusion of the blowing. If this is carried out in the proper manner, your grip pressure will prevent too much flesh from rushing in and under the rim and into the cup of the mouthpiece. You can see that the lip pucker being the opposite of the smile is intended to neutralize both the forward and the backward pressures and assist in the formation of the hermetic seal of the mouthpiece rim and the flesh of the outer embouchure. 8. Always—place, inhale, play; never—inhale, place, play! A reverse order of these points means that you are seriously impeding the synchronization of your basic playing factors. This is a vital point; do not take it lightly! 9. During your formative stages, the mouthpiece pressure upon your lips during your inhalation should be the same as or more than when playing. This hard and fast correctional requirement may be modified according to your particular physical specifications when sufficient development permits; however, in the meantime, carryout this “must” to the letter. Forget your traditional ifs and buts and master this logic. 10. Inhale the high-pitched, whispered inhalation IM (not OM or UM) through the corners of your mouth (never the center of your mouth). Generally speaking, always execute this slower than you think! 11. During the IM inhalation, your tongue must recede about a sixteenth of an inch away from your teeth. This permits great quantities of air to pass freely around your tongue, without resorting to any abnormal stretch in the corners of your mouth to obtain it. The stretch in the corners of your mouth for the inhalation must be minimized. 12. The tongue during the IM inhalation must be very relaxed while receding. The tongue thus far should have two duties: one, it must contact your lower teeth or lower gums during the mouthpiece placement; and two, it must recede during the IM inhalation. The tongue will have additional duties later in the playing; however, it must be understood that no tongue stiffness must ever be tolerated. 13. Whenever time permits—always inhale slowly! This prevents all kinds of unnecessary nervous and muscular tension from entering into your playing. An over-rapid inhalation is often the cause of a quiver or tremolo—the unwanted tonal annoyances which frequently occur during sustained pianissimo playing. 14. During your inhalation, the position of your head and the angle of your instrument must not be altered in any way, because these faults permit changes to occur in both your jaw position and embouchure formation. You must learn to inhale with as little embouchure and jaw distortion as possible. Do not regard your inhalation maneuver as an opportunity to shift gears with the positions of the embouchure and jaw. 15. During your inhalation, especially after playing a number of lower tones, always retrieve your lower lip. This means that your lower lip must be returned to its starting point. In short, your lips during your interphrase inhalation must be identical in position to your initial inhalation. Do not take this important point lightly. 16. If your mouthpiece is placed slightly more to one side of your mouth than the other, then more air should be inhaled from the opposite corner of your mouth. This is vital to keep your embouchure in line. Check on this point by diligent mirror observation. 17. In the PIVOT SYSTEM, the start of the lower tone and the higher tone must be identical in that they are both produced at the outset with the just touching embouchure and they are blown (not tongued) apart. The principal difference must be in the amount of lip compression (pinching power) employed. 18. At the outset of any standard or normal mouthcorner inhalation, your diaphragm and abdominal regions must protrude with firmness. As this inhalation continues a slight expansion will be felt in your chest and an open, free feeling will be noticed in your throat. Make certain that you use this type of inhalation whenever and wherever possible. This is the same principle as air being blown into a large paper bag—the bottom fills first and then the top. 19. Whenever time does not permit, then use the quarter breath—the sniff breath—the gasp breath—the chest heave—etc. It must be thoroughly comprehended that this form of rapid inhalation must be used only to augment but never to replace the standard or normal mouthcorner inhalation. In short, they are intended to serve as a means to an end rather than the standard mode of playing. This habit has become so strong with certain Latin-American performers (because of short, choppy phrases) that they find it impossible to play any type of slow ballad or any sustained passages. 20. Positively never tolerate any lifting of your shoulders during any inhalation because this fault is a positive guarantee that you will be short-winded. Test this fault and notice how it restricts your inhalation. 21. During your inhalation think of the corners of your mouth, your inhaled air, and your tongue all moving backward together as one solidified unit. 22. DO NOT ALTER THE POSITION OF YOUR HEAD OR THE ANGLE OF YOUR INSTRUMENT DURING YOUR INHALATIONS! This point has been repeated because of its significance. 23. At the peak of any inhalation, positively never delay your attack. The exhalation or the blowing must gain momentum from the inhalation, and all work in one coordinated movement, rather than a delay during the so-called bridge between the two factors. You do not delay when you speak; therefore, do not delay when you execute an attack to play. The idea of bottling up the air for a so-called crisp, explosive attack is utterly preposterous. The desired result must be procured from nervous and muscular synchronization—not from any form of physical delay. 24. With each and every initial attack, the diaphragm and abdominal regions must lift (not protrude) in a firm synchronized manner. The higher the note played, the more pronounced this lift must become. Positively never protrude your diaphragm and abdominal regions for any form of playing, especially while ascending, because this old-time playing fallacy has caused more ruptures, hernias, hemmorhoids, etc., among trumpet players than all other playing faults combined. If you possess this fault—lose it! Remember, a clean musical delivery must be the result of correct muscular timing—not nervous delay. 25. POSITIVELY NEVER SMILE TO ASCEND; LEARN TO PIVOT AND THEN TO PUCKER! 26. The tongue is now BLOWN FORWARD in a very relaxed manner from its IM (slightly receded) position so that it strikes the back of the upper teeth, the upper gums, or higher depending upon the range being played. This is sometimes called the first stage of the attack. The proper tongue-arch level may be assisted by using the vowel AAA (DAAA or TAAA) for the lower register—OOO (DOOO or TOOO) for the middle register—and EEE (DEEE or TEEE) for the upper register. Since there are eight distinctly different tongue types, the matter of tongue obstruction, etc., must be discussed during one of your early lessons in the PIVOT SYSTEM. 27. NEVER PERMIT THE TIP OF YOUR TONGUE TO PENETRATE BETWEEN YOUR TEETH AND LIPS IN ANY REGISTER, AT ANY TIME. This is a hard and fast rule but strive to live up to it at all times. TONGUE PENETRATION IS ONE OF THE CHIEF CAUSES OF INADEQUATE RANGE, ENDURANCE, FLEXIBILITY, ETC. 28. After striking, the tongue immediately snaps back (and down in some cases) into the mouth to permit the cone-like air column to strike the back of the compressed embouchure formation, where the least resistance is presented for the blowing. This is often referred to as the second stage of the attack. 1. It must contact the lower teeth or lower gums while the mouthpiece placement is being enacted. 2. It must recede a trifle during the IM inhalation. 3. It must strike the back of the upper teeth, the upper gums, or higher depending upon the particular register being played. Remember, the vowels (already suggested) will assist you in achieving the essential tongue-arch level. 4. It must never be permitted to penetrate between your teeth and lips in any register, at any time. the essential lip-vibrations for the particular range being played. 6. Its arch-level is used to control all types of slurring and flexibility in general. 30. The length of the tongue backstroke is one of the controlling factors for both volume and speed; whereas, the level of the tongue-arch is one of the governing factors for range. Keep these facts in mind while analyzing any tongue problem. 31. All prescribed mechanical (physical) procedures must be carried to extremes during your daily practice periods; however, while you are playing your engagements give your entire attention to music. This is both necessary and proper. 32. Remember, the only time that any sensation is new is the first time; therefore, when you strive to master any new mechanical point make certain that you do not expect the new sensation to be as vivid in later attempts, or you will be carrying the point to extremes. Failure to observe this important fact has caused many performers to experience extended playing frustration. 33. Remember, there are no playing secrets—just logic and common sense. Intelligent, consistent daily practice and study invariably wins out over this word talent. must study this ENCYCLOPEDIA OF THE PIVOT SYSTEM and the PIVOT SYSTEM MANUAL thoroughly and completely. In the PIVOT SYSTEM four standard embouchure and jaw types and five subtypes (nine in all) are utilized and you are directed to fall into one type or the other. This is the only method whereby your individual differences are given scientific consideration. In this manner Mother Nature is satisfied. 35. If you are really serious about your study, I suggest from an hour and a half to five hours of study and practice daily. You must learn to rest exactly as long as you practice. Five minutes of playing means five minutes of resting, etc. In this way you are constantly building up your playing reserve and endurance and never permitting a thoughtless, illogical practice period to tear it down and destroy it. May I suggest a daily review of these thirty-five basic points of the PIVOT SYSTEM.